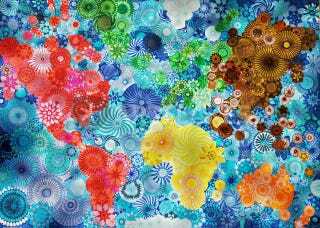 Above is one in a series of world maps created by artist Rachel Evans using nothing more than a spirograph, the mesmerizing geometric drawing tool of your childhood. "Altogether this piece took me around a week (but that would be non-stop drawing) to finish," she writes on her website. "So, I worked part time, and had it completed in around two months… but I was working on it every day for at least an hour." Featured here is a video documenting her technique, which combines spirography, detailed outlining, cutting/pasting and good old-fashioned hand-coloring. Really impressive stuff. Read more on Evans' website, where she also has prints available.